Put this onto your ears if you want to beat silence, yet not distract you from whatever you are doing otherwise. The album does a great job of catching you mid-thought, making you realise how cool the sounds sound that you were not listening to, and letting you of the hook not a full minute later. Best consumed after sunset, in a darkened room, while you shake off a busy day. Having Found Serenity Beneath the Starry Skies gives you a bit of everything in 6 and a half minutes: loooong intro, but finally even a bit of beat! 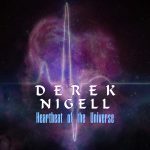 Heartbeat of the Universe take its time with 11 minutes. Don’t expect major events before minutes 7, when the frost has thawn, and percussion comes out to play.